Cameron Highlands is one of the perfect cool getaway destinations for locals in Malaysia. 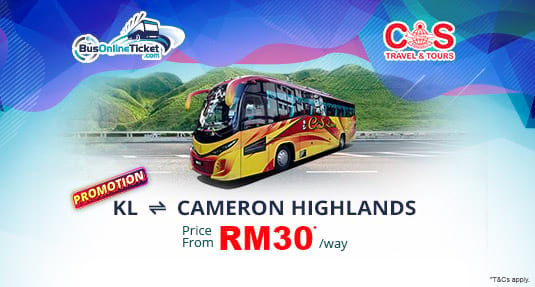 Now, CS Travel has launched their special bus ticket promotion to Cameron Highlands on BusOnlineTicket.com. Check out BusOnlineTicket.com and travel to Cameron Highlands with CS Travel! The boarding point and arrival point in Cameron Highlands are at Tanah Rata Bus Terminal while the boarding point and arrival point in Kuala Lumpur are either located at Terminal Bersepadu Selatan (TBS) or KL Sentral. Moreover, the pick-up point for Penang and Butterworth is located at Sungai Nibong Bus Terminal and Penang Sentral Bus Terminal respectively. What are you waiting for? Book CS Travel Cameron Highlands bus ticket online now at our official website BusOnlineTicket.com or via our mobile app, which can be downloaded for free on App Store and Google Play. All the bookings via BusOnlineTicket.com are instantly confirmed upon successful payment.